It’s time to say goodbye to another year and welcome in a new one. 2011 has been one of the most delicious years I’ve experienced so far, from dining out to cooking in my own kitchen. So while I prepare for what will hopefully be an equally delicious 2012, let’s look back at some of my favourite things I ate in 2011. 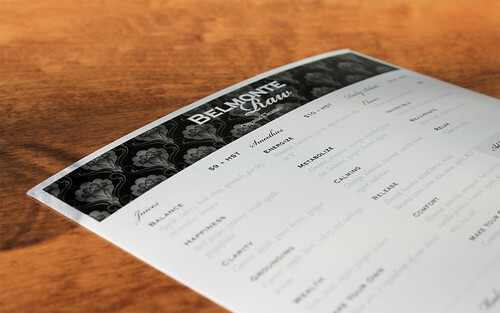 My lunch at Belmonte Raw surpassed all expectations. Not that I knew what to expect really, as this was my first experience with raw cuisine. But Carole Belmonte of Belmonte Raw is doing something right here. All raw and all vegan, you leave her place feeling refreshed and energetic after eating her food. It's light and fresh, yet packs a lot of flavour too. 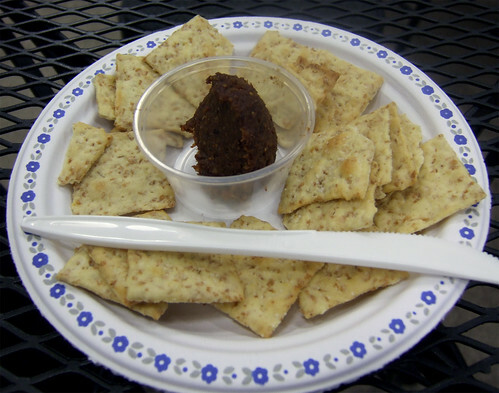 The biggest surprise was how well Carole and her team have recreated the textures of these raw dishes to their real-life counterparts, from ground "nut" meat, to couscous made from finely-chopped parsnips, to dehydrated oatmeal cookies. Thanks to the use of raw ingredients, the food themselves retain their bright colours, making for gorgeous plating. Even if you're a carnivore, I highly recommend you check this place out. 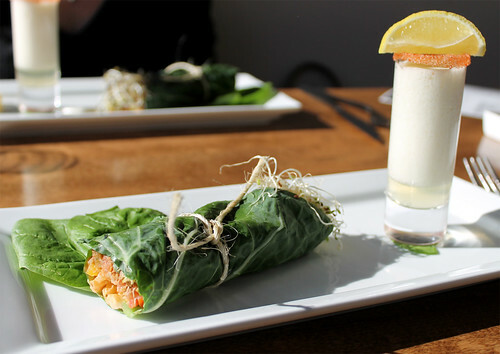 Give it a shot, go with an open mind, and I'm sure you'll see raw cuisine in a whole different light. 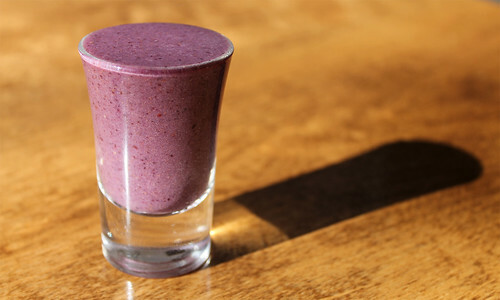 Stop by Belmonte Raw for one of their delicious cleansing juices or smoothies to start your 2012 right! One of the best desserts in the city, hands down. 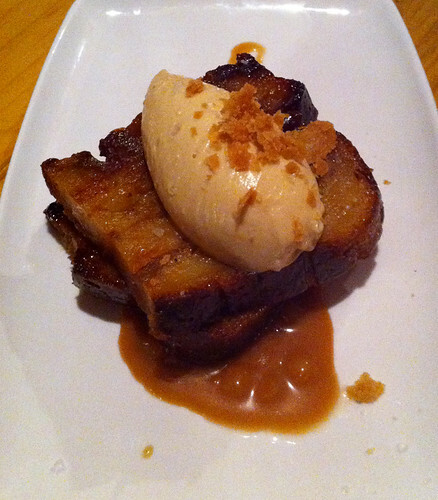 I’m usually not a big bread pudding fan, but this is the king of bread puddings. And who could resist this? Bailey’s caramel. Dolce di mascarpone. Maldon sea salt. Crumbled pie crust. pieces of sweet-tart apples. Yeah, there’s no sharing of this dessert. Get your own. I first tried this Bacon Jam during one of Buster Rhino's sample tasting days back in March. Served as an appetizer, each table received about a tablespoon scoop of this thick concoction that smelled simultaneously sweet, savoury, smokey, and spicy. We were instructed to spread some of the jam onto the accompanying crackers. What I got an instant was a load of flavour in my mouth. First you get the smokiness and savouriness of the bacon before it moves on to the sweetness from the maple syrup, then the acidic from the cider vinegar. You get a slight kick at the back of your throat , and a deep richness from the little bit of coffee and chocolate Darryl used in his recipe. And then the lingering taste of smoke and spices. It was intense. It was memorable. And it inspired me to make these Bacon Jam and Cacao Nib Shortbread. Darryl doesn’t sell the jam in-store, but lucky for you, he’s posted the recipe on his blog so you can easily make this baconlicious condiment at home. I tasted former c5 Executive Chef Ted Corrado's Calabrese sausage at my first sausage league event I attended (Corrado was the first pair to compete from Round B). Corrado countered Marron Bistro's entry with this big, bold, beautiful dish. 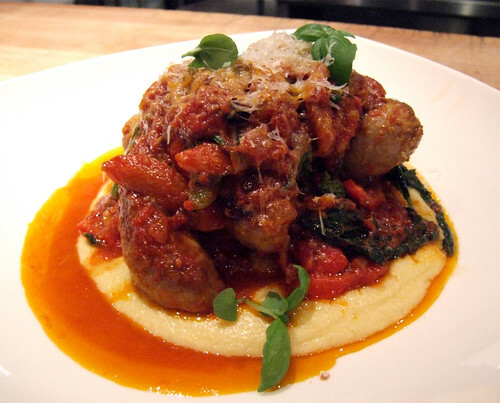 It’s a traditional Italian sausage, a dish that was inspired by Corrado’s grandmother. I loved everything about this dish. The visual appeal, with the sausages piled high and served family-style on a wooden plank. The smells of savoury pork, herbs, spiciness, basil, cheese—it all screamed home-style Italian and instantly made me salivate. Pure comfort. And it won me over (and the majority of the diners that evening). 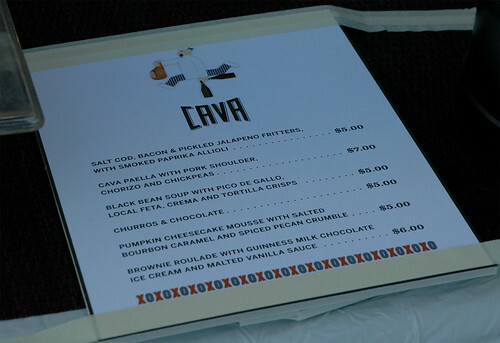 La Carnita was one of the food phenomenons of 2011 in Toronto. It started off as a pop-up taco “stand” that sold artwork for $10, and in return, you got a “goodie bag” of tacos. Whether you think this is gimmicky or brilliant marketing, it worked, because people came in droves to score one of these limited tacos. Each pop-up event La Carnita hosted only had a few tacos available, and line-ups snaked down the neighbourhood even before they officially opened for business during the lunch hour. Clearly Toronto was craving a good taco, and good they were. 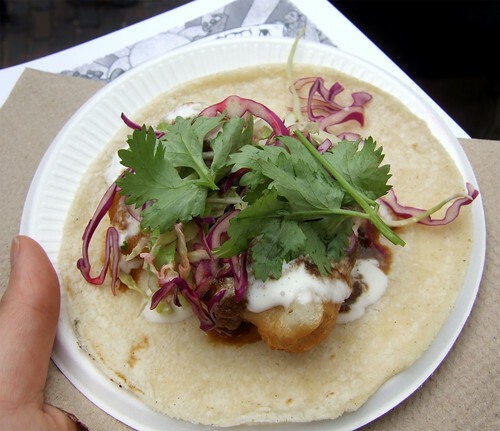 Their Voltron Fish Taco is perhaps my favourite of the ones I've tried—crispy beer-battered Pacific Cod, lime crema, and Voltron sauce. It was an incredibly hot, sweltering summer day. I had just spent the morning sweating in the unrelenting sun, picking peaches. Famished, my friend Suzanne and I found our way to the popular El Gastronomo food truck's usual weekend stomping grounds at Flat Rock Cellars for lunch. These fritters were crispy on the outside, and so soft and light on the inside. Little pockets of sweetness popped up here and there with each bite from fresh in-season local corn kernels. 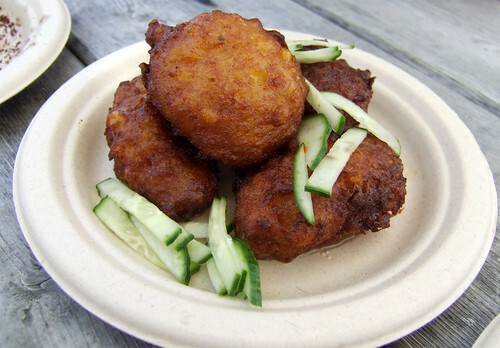 The fritters, when fried up, were drizzled with a hot and sour vinaigrette, balancing the whole plate with some acidity. I loved this dish so much I kept on begging El Gastro via Twitter to make these for the August Food Truck Eats event so I could get my corn fritter fix again. Thankfully, they did. 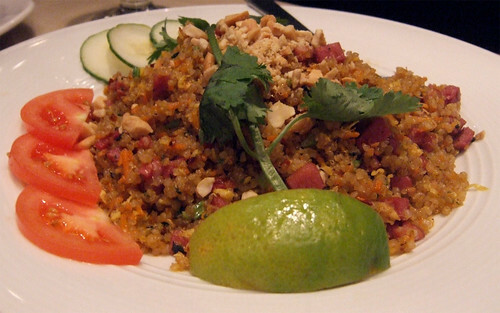 This is such a refreshing take on fried rice, and a perfect dish for gluten-intolerant foodies. Made with stir-fried quinoa instead, it is super light, making it a great accompaniment to the heavier, more powerful curry dishes. And just because it's healthy, don't think that it's bland. The use of the smoked duck adds some great smokey and savoury flavours, and is reminiscent of Chinese sausage. While Joe Beef has been open for quite a few years now, the popular Montreal restaurant was brought back into the spotlight of glory this year thanks to the release of their new cookbook, The Art of Living According to Joe Beef. With all the hype surrounding this restaurant, I decided to go check it out myself during a quick visit to Montreal. I heard a lot of talk about Joe Beef's lobster spaghetti, so naturally, when I saw it on their chalkboard menu, I immediately ordered it. And it did not disappoint. 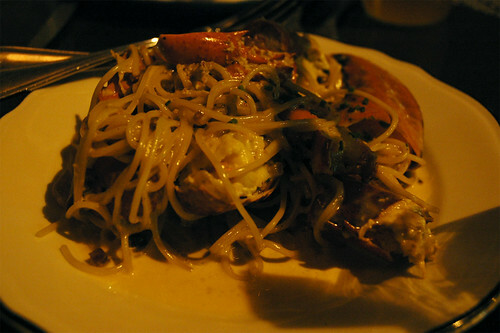 The dish is jam-packed with lobster flavour (and lots of lobster)—the sauce creamy and fragrant, the lobster succulent. It is a decadent dish, and no wonder after I saw the recipe for this dish in their cookbook (loads of butter and heavy cream!!). To this day, I still don’t know who made these awesome dumplings at the first TUM event. They were an unassuming bunch—only a cardboard poster with their dish written out in black marker gave a hint to what they were serving up. But what I ate was a quite a surprise, in a very good way. 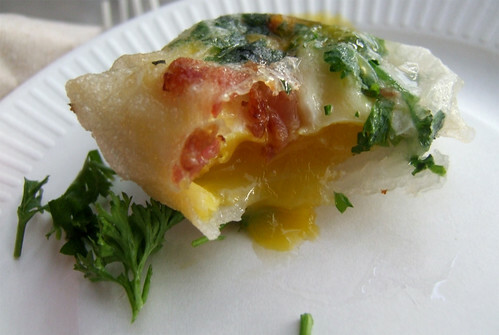 A clear dumpling skin that was crispy on the outside, with a perfectly cooked, gooey egg yolk oozing out and bits of bacon inside the dumpling. It was gone in two bites, and I wish there was more to it because it was so good. What impressed me was their ability to be consistent with each dumpling and cook the egg yolk perfectly—a few seconds too long could have resulted in an overcooked egg yolk, and you wouldn’t have gotten that runny effect that I think made this dish shine. Imagine having a big plate of these for breakfast…the new generation dim sum? When it comes to street food, this is the kind of the stuff that I love and crave. Deep-fried food hits a certain spot that’s so satisfying, and when you walk by and are suddenly hit with that sensational smell of deep-fried goodness, you’re instantly curious. While not a truck, a number of Toronto chefs took part in the inaugural Food Truck Eats events this year, presenting hungry diners with their interpretation of street food. Chef Chris McDonald of Cava did a sensational job, serving up some unique Spanish tapas dishes, like these salt cod fritters. Golden brown, crispy, savoury with a bit of heat, and oh-so-light and fluffy. These were delicious and disappeared fast! From the tasting menu I got at Belmonte Raw when I visited, this was my favourite dish. The raw burrito consisted of vegan “meat”, made from ground sunflower seeds that were spiced to get the right texture and flavours, stuffed inside bright green collard greens along with an amazing chipotle "not-so-cheeze," assorted sprouts, tomatoes, red pepper, jicama, and cilantro. The taste was absolutely fresh and wonderful. The seeds actually had the consistency of ground meat and was so flavourful from the spices used, and there was a nice crunch thanks to the use of raw ingredients. Washed down with Carole’s “tequila shot”, a concoction of cashew milk, and lemon and lime juices, it tasted exactly like how real tequila would taste like but was actually good for you! This was an absolute delightful dish! I haven’t eaten a lot of gumbo in my life. One, because it’s usually not the first item on a menu that I'm drawn to. And two, it’s just so hard to find a good gumbo north of the border. But the gumbo at Acadia totally proved me wrong. Chef Matt Blondin’s version was absolutely delicious. 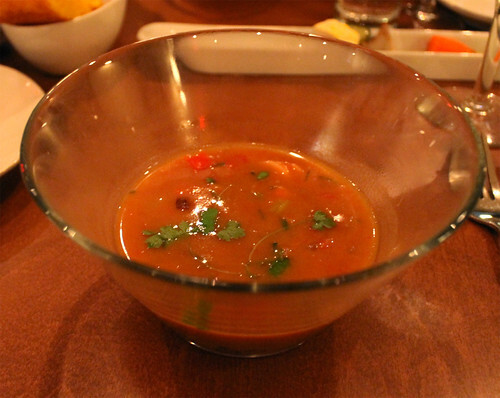 So flavourful, with andouille sausage made from prawns and black rice swimming at the bottom of the bowl that attended the perfect bite and texture to the soup. It’s a big bowl of comfort, the perfect meal on a cold winter’s night with an order of their amazing cornbread. It may one of the last things I ate in 2011, but it was so good that I had to add this dish in the last minute. 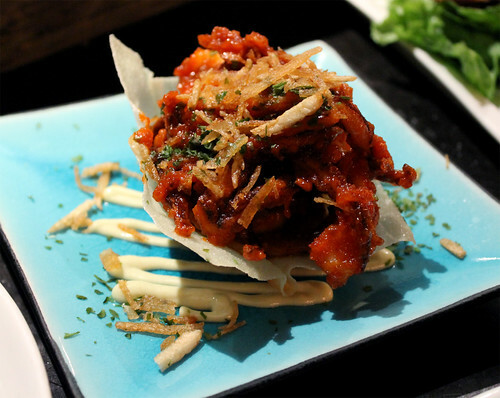 I'm a huge fan of anything calamari, but especially when it's fried. The version at GUU Sakabar was lightly dredged in flour before being fried (rather than battered), then tossed with some delicious spicy ketchup, their version of a cocktail sauce. These are incredibly addictive, and makes for a great snack alongside drinks with friends. 2011 marked another year of great cooking in my own kitchen. Here’s a look back at ten of my favourite dishes I created. Click on the link to read the original post and recreate the dishes in your home! Wishing you all a very Happy New Year! Here's to an even more delicious 2012! Restaurant Brugge January 6, 2012 at 2:24 a.m.